I started zinnia seeds indoors and they look very healthy (about 10" tall). I planted some 3 days ago, and now noticed one is bent over. The stem has a split in it about an inch long. This has happened in previous years. It causes the zinnia to finally break off at that spot. What causes this, and what is the solution? Thanks. Ten inches is a good size for seedling plants. 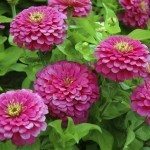 Taller varieties of zinnia need support after a few weeks of growth. Fix a stake in the soil, close to the plant stem. Leave at least a couple of inches of space between the plant and the stake, so that the stem has enough area for growth. This should help alleviate the bending or falling over issues you have previously been experiencing.